This paper will be presented in Halifax, Canada on June 2013 at the upcoming CTRF conference. Resource companies experience severe logistical challenges operating in Northern Canada. Developments in remote areas face high transportation costs, difficulty moving physically large cargo, and the extreme seasonality of ice roads and barge transportation. The cost of all-weather road construction and the lead-time for environmental approval can prevent otherwise viable projects from moving forward. These transportation and logistics barriers negatively impact the profitability of resource development projects. A new generation of cargo airships is emerging that have the potential to reduce economic barriers for mines that otherwise must build all-weather road infrastructure or rely heavily on ice roads. The purpose of this report is to evaluate the economic conditions under which cargo airships can provide improved transportation services to mining operations in Northern Canada. This paper uses financial models to determine the break-even volumes that are required for airship operations to compete with trucks on all-weather roads at varying haul distances. The next section presents a conceptual framework. 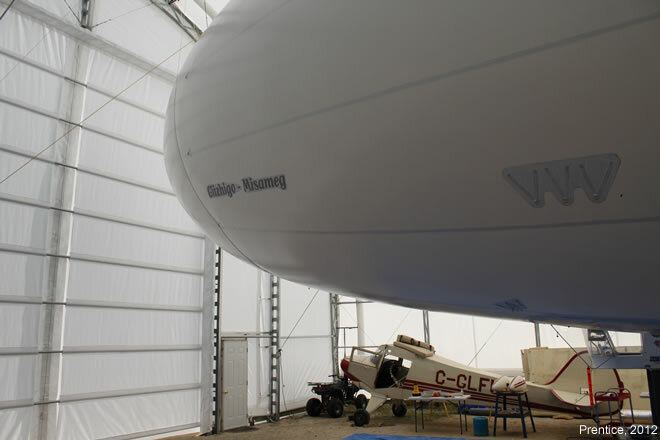 Subsequently, a brief survey of cargo airship developments is presented along with the method of analysis and a description of the cargo airship and truck costs. The analysis is applied to two separate mining scenarios with varying cost assumptions. The article concludes with a discussion of the contextual issues and topics for further research.